We're something like halfway-ish through summer, and I find myself longing for school to start again. Don't get me wrong - I've been enjoying every humidity-drenched moment I spend with my kids. But I do heave a heavy sigh every time I pull out the 12-pound folder of assignments the kids have to turn in monthly. That's right - I miss school because come fall, they'll have less homework. I'm not saying there isn't anything good about summer homework. 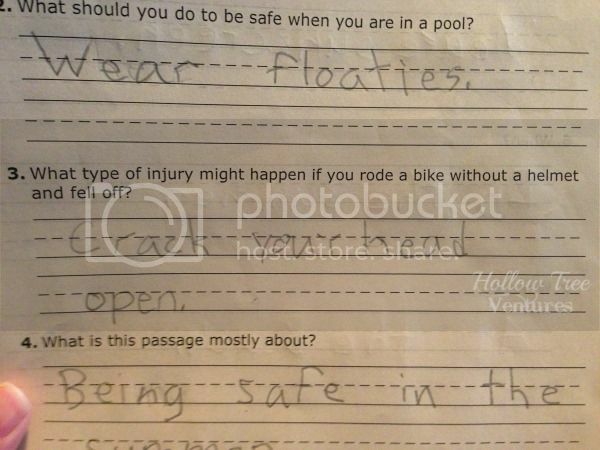 For example, without it I wouldn't have gotten Zoe's candid answer on this worksheet about summer safety. Well, she's certainly on to something there. Plus, there are probably some educational benefits too, but that's just speculation. So why do I hate it? I stood up in front of the class over on In The Powder Room and gave my report, reprinted here with permission. My kids are reading a lot lately. Don't be too impressed, they're also graphing miscellaneous facts about manganese dioxide and illustrating the word "numerator," all while whining loudly in the name of Required Summer Homework. Reading just happens to generate the least resistance, probably because they can read whatever they want (as long as they want to read at least one book about the Great Lakes, one about Russian culture, and one about 19th century poetry). My kids hate summer homework, which is laughable. It's ridiculous, because they don't realize how grateful they'll be that their brains still function when school starts, and because it's not really all that much work, but mostly because no one hates summer homework more than I do. Don't get me wrong. I fall squarely in the camp of Responsible Parents who understand the value of exercising the old noggin between grade levels. It makes for a smoother transition back into school, gives kids a stronger knowledge base to build upon, and I'm guessing it makes things easier for teachers who don't have to waste September reviewing the alphabet and basic addition facts with their new batch of sixth graders. So yes, it's important. It's valuable. It's a worthwhile way to spend a few hours each week. But ohmygawd I hate it so much. My kids are taking timed math quizzes and copying nutrition facts off boxes of Trix, but they aren't the only ones suffering. Because who has to nag them about it? Me. Who pulls a muscle digging long-forgotten graph paper out of the closet? Me. Who has to help them fit all eighty definitions of "scale" into the maddeningly tiny 2-inch space provided? Me. Who's left holding arms and legs and heads of pop bottle robots while the glue-doused joints dry? Me, me, me. But it isn't just the time commitment, or the hassle of having yet one more thing to keep track of. Deep down, part of my issue with summer homework is that it makes my brain hurt, when all it really wants to do is atrophy like the kids' brains. Why do I have to be responsible when they want to procrastinate? I'm just as lazy as they are! I don't want to think about manganese dioxide either, and I barely remember what a numerator is. I'm constantly asking questions ("How would you describe the life cycle of a butterfly?") to make it sound like I'm testing them, when really I'm watching cartoons over their shoulders. Then, when things get frustrating, my kids get to cry it out, whereas I have to refrain from screaming, "You're right! This is stupid! Must no verb be left unconjugated?!?" The whole thing gives me a headache. But, to ensure their brains grow stronger and smarter, I'll graph, I'll conjugate, and I'll strain to convince them that Lake Huron is even remotely interesting. Hopefully they'll go read about it for a few minutes. Mommy's brain needs a break. Homework during the summer? Man times have changed. Next thing you know they're going to say kids should always wear seat belts. I know! Advancements in education and safety make me angry. Then hungry. Then sleepy. Wait, what were we talking about? Gah, I should've done summer homework when I was a kid. I don't remember the last time I had a real summer. The curse of summer homework, ugh. There would be HUGE raises across the board, that's for sure! Thank you for feeling my pain. Now, can I borrow your protractor? Wow! We didn't have summer homework unless we were in honors or AP classes in high school. Crazy for me to think of little kids doing it.